^ Hoffmann, Robert S.; Andrew T. Smith （2005年11月16日）. Wilson, D. E., and Reeder, D. M. (eds). ed.. Mammal Species of the World (3rd edition ed.). Johns Hopkins University Press. pp. 209-210. ISBN 0-801-88221-4. ^ 4.0 4.1 RM Lockley. The Private Life of the Rabbit. Andre Deutsch. 1964年. 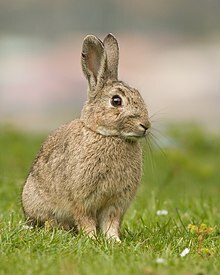 ^ The virus that stunned Australia’s rabbits. [2007-06-21]. ^ Building a Rabbit "Bomb" in Australia (PDF). SCDWS Briefs. January 1995, 10 (4). ^ The Camel, the Hare and the Hyrax, chapter 6 (PDF). （原始内容 (PDF)存档于2012-06-16）. ^ Kemppainen, Jouni K. Kanit keskuudessamme (The rabbits among us). Suomen Kuvalehti. 2007年10月: 76–83 （芬兰语）.